Its hardly surprising with the Sun, Moon and Ascendant in Capricorn, but I am fascinated by History. I often wonder what would have happened if I’d studied the subject at University instead of Politics. But I know that everything happens for a reason. While at uni, I discovered astrology and the stark contrast between the revelatory truth of my new passion and the utter irrelevance of the subject I had previously chosen made my consequent decision inevitable. I dropped out of University and devoted my time to proper study and the rest as the say is history. Maybe if I’d studied history in the first place, I might not have gone down my chosen route which such clarity and determination. But if nothing else, at least I have some kind of understanding of how political pundits put together their theories. Usually these theories are based on a political viewpoint and one clear example from history which is enough for them to tack on lots of other lesser ones ( which have largely been invented ) in order to prove their point. Take for example a common theme ” Trotted ” out by Marxist historians – that ” War is a breeding ground for revolution “. This has been repeated often enough for it to have become something that most academics in the field will nod their heads in general agreement. And it sounds right as well. The theory is that the working classes were so appalled at the mass slaughter that they came home and overthrew their own tyrannical rulers. This coincides with the view that the powers of the status quo were distracted by the conflict and so unprepared to put down the insurrection with their usual force and enthusiasm. The indisputable evidence put forward for this is that of World War One. And then it is padded out with lots of other tiny examples that were in fact little more than chance connections, to fuel the philosophical preconceptions of the author – that the Marxist theory of history works – so there. And since the biggest and most comprehensive revolution in the whole of history occurred under these conditions, its impossible to argue against it. This is the problem with much academic philosophy, whether it occurs in the field of politics or even science. If x produces y under certain conditions it is assumed to do so whenever the observer believes that those conditions recur. This continues until it is proved to no longer work and then the theorist assumes that the previous conclusion was wrong and looks for another one. The only problem with that approach is that astrology shows us that the conditions of one moment are unique, never to be repeated, so trying to have a universal theory of history is just a complete waste of time and energy. What is needed is to understand the particular moment. Even if it does seem to back up the theory. The Sun in this chart is in Scorpio, the sign which is most associated with revolution and transformation. The Moon and Ascendant are in Virgo, the sign of the workers. The Sun is the apex of a T Square from the opposition between Uranus and Saturn. Uranus in Aquarius, is the socialist ideal of the classless society where everyone lives in harmony and equality. Saturn in Leo is the complete opposite, it is an authoritarian and autocratic rulership. The result of the clash between these opposites is projected onto the apex of the T Square, the Sun in Scorpio – Revolution. However this revolution could only have happened with the planet that rules these things, Uranus in its own sign, Aquarius. How does it tie in with World War One ? This is the chart for Britain’s declaration of war with Germany. It could be said that the real chart for the war would have been cast on the 28th July when Austria started the ball rolling by declaring war on Serbia in response to the assassination of the Archduke Ferdinand. But for these purposes either chart will do. Besides this horrible conjunction, this chart does have some tough aspects. Perhaps we can see Saturn and the Moon in Capricorn as representing the old powers and authorities. They are in close inconjunct aspect with each other. The Moon is in Capricorn in exact opposition with Neptune, perhaps signifying the confusion over exactly why it was being fought in the first place. The Moon in Capricorn in the 10th, suggests that its mostly about who is boss and Saturn in the 2nd points to money as a major factor. Saturn is square to Mars and conjunct Pluto showing that these nations would be engaged in battle. The Sun is in Leo in the 4th house in opposition to Uranus in Aquarius. This aspect could be used to describe a number of things about the war. But one of those would certainly be the opportunity for a bit of revolutionary overthrow ( Uranus in Aquarius ) of dictatorial regimes ( Sun in Leo ) back home ( in the 4th house ). Uranus is also widely conjunct Jupiter at 18 degrees of Aquarius perhaps pointing to the area of the Zodiac where the opportunity for said revolution is greatest. 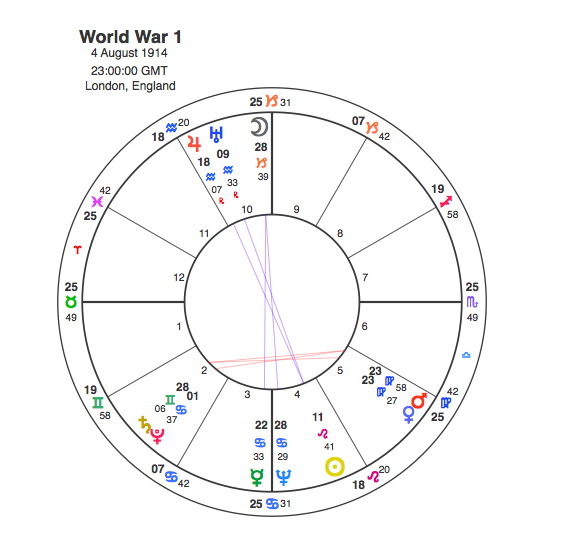 So when Saturn moved on to 14 Leo, the Sun to 16 Scorpio and Uranus to 19 Aquarius, the conditions for revolution indicated by the chart for the 1st World War, were met. The old powers were distracted by the war and the Bolsheviks took full advantage. But the Russians weren’t the only ones to try their luck. Eighteen months previously an uprising of a different kind occurred in Ireland. Again we have the Leo / Uranus at 19 degrees Aquarius opposition, although this time its Mars and the Ascendant that’s doing it rather than Saturn. Perhaps this has something so say about the nature of the regime that the Irish Republican Brotherhood were trying to overcome, that the British oppressors were more ruled by Mars than the Russian Tsarist regime who were Saturn. Its also very interesting that the same aspect that was critical to the chart of the start of the First World War, is there again at exactly the same degrees, the Moon in Capricorn opposite Neptune. 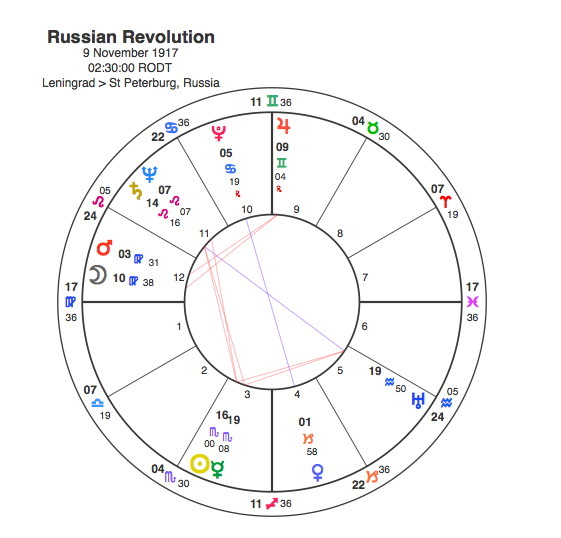 Both of these oppositions are part of T Squares, but in this case the apex planets were not in the sign of revolution as in Russia. The apex Mercury and the Sun in the Easter Rising chart are in the sign of the status quo, Taurus so the result was the insurrection was put down with considerable force by the British. The Moon / Neptune opposition could be pointing to a confusion and things that the rebels had relied upon not going according to plan. They were expecting a ship load of arms from Germany to arrive by sea ( Neptune in Cancer ), but this was blocked by the English navy ( opposition Moon in Capricorn ). One hundred years later, every Irish schoolchild knows the names of the seven leaders of the Easter Rising, all executed in the fortnight after the rebellion. They were Patrick Pearse, Tom Clarke, James Connolly, Thomas McDonough, Sean McDermott and Joseph Plunkett. Capricorn Research has a collection of 157 charts of people involved in armed insurrection of some kind or another. Its difficult to know what to call them, because one man’s freedom fighter is another man’s terrorist. I have called them Political Rebels. Most of the collections as part of the Capricorn Research Project are based on choice of career. There are a large number of very significant distributions that prove an astrological link – see Does This Prove Astrology. However these are generally to do with the placings of the Sun, Venus, Mars, Jupiter and Saturn. There are hardly any to do with the Moon. I am not sure what the reason for this is but in the case of political rebels it is seriously turned on its head. The most common Sun sign is Leo ( 138 % of the expected figure ) but this is not statistically significant enough to be sure of a link particularly on such a small sample. However the Moon in this sample joint top scores in Gemini and Libra at an extremely high 176 %. Fascinatingly the lowest sign is as astrologers would expect Capricorn with a mere 38%. The ” p “figure for the distribution is an astonishing 0.00374, where anything below 0.01 is considered by statisticians to be proof of some sort of connection. Such a figure is scarcely believable in a sample so relatively small. In simple terms the Moon is twice as likely to be in Air signs as any other element. Well it could be that people that take politically rebellious action are thinkers rather than feelers. Their instincts are perhaps based on ideology but you could equally say that they have a detached compassion for the struggles of their fellow men. Of the Easter Rising Seven, three have the Moon in Aquarius, three in Virgo and one in Sagittarius. Of the three that have the Moon in Virgo, two have it conjunct Uranus and the other one also has it in the same sign. Two of the three with the Moon in Aquarius have it in trine to Uranus. Another intriguing thing that comes up is that three of them ( as opposed to the expected figure of one ) have the Moon’s Nodes falling across Aquarius and Leo. So all 7 have a very strong Moon / Uranus connection. Out of the collection of 157 Political Rebels, the strongest individual aspect by some distance is the Mars / Pluto conjunction, occurring at more than 200% of the expected number of times. Two of the Easter Rising Seven have this conjunction which is interesting since only 4.5 % of the population have it. Another interesting fact is that five of them have significant Uranus transits around the time of the insurrection. Plunkett has Uranus conjunct his Aquarius Moon, Pearse has it square his Sun, McDermott has it square his Nodes, McDonough has it just past his Sun and conjunct his North Node and Connolly has it square his Mars / Pluto conjunction. Capricorn Research doesn’t normally use the Moon’s Nodes and this explains why they are not presented on the charts in these articles. 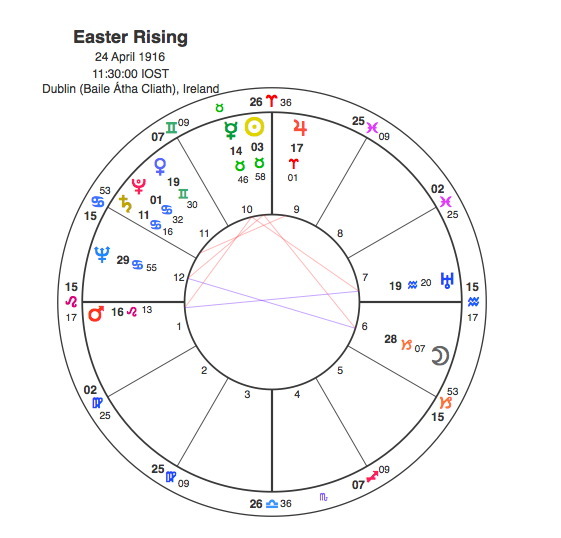 However there does seem to be such a strong connection between the Moon and Uranus in these charts that it is worth pointing out that the Nodes in the Easter Rising chart fall at 3 degrees of Aquarius / Leo in exact square to the Sun in Taurus. So why did the Irish Uprising Fail, when the Russian Revolution succeeded ? Simply because they chose a festival at the wrong time of year. As a strongly Catholic country its understandable that Easter would be chosen, particularly with its connections with death and resurrection. The trouble is that Easter in 1916 fell very late with the Sun in Taurus rather than the usual Aries. Aries might have been a better time for an armed insurrection to succeed given the Taurean connection with the status quo. However there would have been no T square including Uranus so it could not have happened at all. There was a feeling amongst the Republican leaders that they might have missed their best opportunity during the earlier part of the war. The astrology of the situation probably bears this out. If they had gone for Halloween 1915 rather than Easter 1916, Uranus would have been at 12 Aquarius again opposite Mars but an apex Sun would have been at the other end of the T Square in Scorpio. And Sun Scorpio Patrick Pearse might have gone on to be famous as Lenin. The T Square is a beautiful example of what Marxists would call dialectical materialism in action. Two opposing forces create a tension that inevitably brings about a result in a third direction. At Easter 1916 the Republicans just had hold of the wrong end of the astrological stick.